Mongolia is blessed to have the Christian faith here for the last 25 years, after Communism ended with the fall of the Soviet Union. Christianity is growing, but materials in our language to equip churches and leaders are scarce. As a Lutheran church, we would like to have more classic Lutheran materials to root our church in the Word and also in the historical Lutheran heritage, especially as Mongolian Lutherans are now uniting together to establish a national Lutheran church. 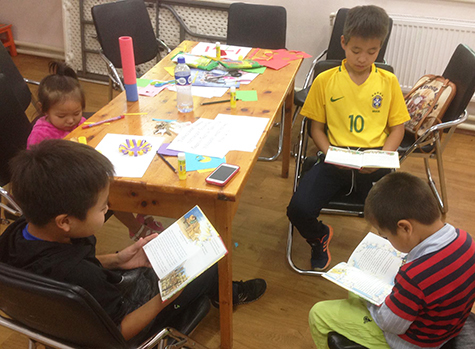 Mongolian children are absorbed in reading their new books: A Child’s Garden of Bible Stories, translated into the Mongolian language by LHF. LHF has translated and published the Mongolian A Child’s Garden of Bible Stories, which is very simple yet substantial material for kids to learn the stories in the Bible. It is not only for the kids, but also for parents to learn too! We Mongolians never heard the stories in the Bible before, and those new believers who are parents can also learn from the book. I like A Child’s Garden of Bible Stories, because it is not just a kids’ coloring book; it’s intended more for the edification of young believers. Lutherans in Mongolia are now uniting together to establish a national Lutheran church, the Mongolian Evangelical Lutheran Church. So, we need very basic Lutheran documents such as the catechism and Creeds. Also, we need devotional books for the members to read and be equipped. Our Bible School needs lots of good theological and devotional materials to work on. Having good Lutheran materials will help us grow stronger in faith, which will result in growth in numbers. These Reformation teachings are very important in Mongolia today. Our country is very much the same as in Luther’s day. All sorts of Christianity have poured into Mongolia in the last 25 years, which has confused the general public and become a hinderance to the Gospel. What Luther taught with sola Scriptura, sola fide and sola Christus is so relevant for today’s church all around the world! And it is true to Mongolian church. We should renew our worship, faith and understanding of the Scripture as we embark on the 500th anniversary of Reformation. We should reform our poor understanding of the Scriptures that are tainted by the Renaissance, secularism and atheism.